“Gold Fish” measures A5 or 5.75×7.5 inches. I did a quick sketch with pencil and then used a couple of fountain pens filled with Noodler’s Black. The blue is is J. Herbin Bleu Nuit. Cost is $25 USD, shipping to CONUS included. This entry was posted in Uncategorized and tagged bleu nuit, clairfontaine, daily, drawing, graf, ink, j. herbin, noodlers, sketch on 20110414 by leslie. One of the other sketchbooks I received from Exaclair was the Clairfontaine Graf It pad. I’d seen these on several occasions at Artist & Craftsman and passed them by due to the cover being… well, kinda lame*. In addition to the plain black grainy text and images, each cover is made with various colors of card stock that folds behind the staple bound pad. The back is supported with sturdy heavy chipboard. Each page is microperfed for easy removal. The perf is sturdy enough that you can turn the page and it won’t tear out, unless you want it removed, it stays. The pad is often sold on American websites as “6×8.” That may be the outer dimensions of the pad but the actual sheet size is 5.75×7.5 inches. There are 80 sheets in each pad. I did my usual battery of tests on this paper and it withstood them all. I have to say that this paper is amazing. Though it’s only 90g (41lb) it’s super sturdy and accepts a lot of media without issues. It takes some serious effort to get stuff to soak through. When I say stuff I mean ALL the stuff I’ve tossed at it. See the pic below. With watercolor it accepts the color well. The paper cockles as is expected with paper this thin. I find this to be a great paper to experiment with techniques and color. It responds well to puddles of water as well as thin washes. Color stays true and doesn’t get muddy on the page. While drawing with ink I was able put down multiple layers of ink without cockling and bleed through. Heavy layers that would have bleed through many other heavier papers did not bleed through on this paper. Noodler’s black bonded with the paper well enough that I didn’t worry about it lifting much with my water brush. Colors seem to pop off the page. I did try gessoing the page but I don’t see the point as the paper is tough enough to survive most stuff without the gesso. I also scrapped acrylic paint over the page to see how it would work, and it worked just fine. This paper is also amazing for pencil. It has just enough texture and tooth that pencil feels really good on it and it hold a lot of graphite, so darks are really dark. My final verdict on this pad is that it’s great. The paper is awesome. The format it’s served in is where it is lacking. I hate perforations (my own little quirk.) I prefer a pad that allows the pages to stay together. The staple binding is crap for keeping stuff together, I made a little folio out of a USPS priority mailer to keep my drawings together. 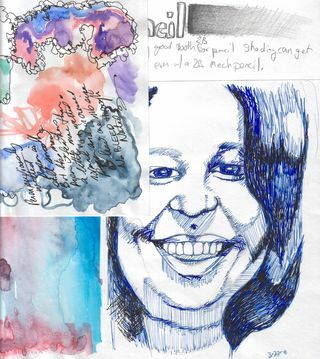 For art journaling it would be a great pad to do drawings in and then cut out and glue into your regular art journal. The paper is thin enough that if you draw a face and cut it out the edges won’t be all that noticeable. The pad is pretty cheap. I found it online for $4 to $6 the larger size is pretty reasonably priced too at around $9. These are prime pad for binding into a sketchbook. If this came bound like a moleskine or a Rhodia Webbie I’d buy it. I know that the reason this pad is so inexpensive is that its bound inexpensively, 2 staples straight through to a sturdy backer. I like this paper a lot, in fact the next time I’m at Artist & Craftsman I’ll be picking up another one of these in another size. Perhaps I’ll bind the large size into a nice art journal! 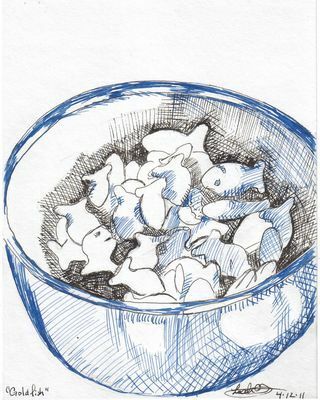 This entry was posted in Review and tagged art, clairfontaine, draw, exaclair, graf it, ink, journal, paint, pencil, sketch on 20110331 by leslie. Stephanie of RhodiaDrive hooked me up with Karen of Exaclair, the American importer of several very fine French made stationary products so I could do some reviews. I received a box in the mail and I felt like a kid at Christmas. There is nothing quite like opening up a box of sketchbooks to get my heart racing, well pen products would be a close second. Anyway, one of the products contained in that wonderful box was a Rhodia Webnotebook. It’s the larger size, 5.5×8.25 inches (I14x21cm) with blank cream colored pages. There are 96 sheets or 192 pages. When I first opened the covers the color reminded me of oak tag; creamy, warm and lovely. The paper is 90g (roughly 24lb) which seems kind of thin when you’ve been working on 140lb watercolor paper for the last few months. When I ran my hand over it felt glassy smooth. Clairfontaine paper is known for this feature and is sought after by people who use fountain pens. The cover is black with the Rhodia logo inset into the center of the front cover. Like all notebooks of this style there is an elastic to hold the whole thing shut. The plastic/vinyl of the cover is soft, like fine leather. I have a journal made of deer hide and the feel of this pleather rivals its softness and feel. I handed the journal to someone to check out and she actually said “Ooohhh, that feels nice that feels really nice, what is it?” Like, leather the cover does show greasy fingerprints, unlike leather those greasy fingerprints wipe off with a damp rag. Yes, I tested this by eating French fries at my desk and picking up the journal and having to wipe it clean. 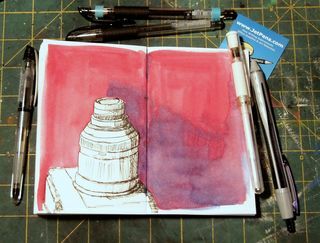 This entry was posted in Art Habit, Review and tagged clairfontaine, draw, fountain, journal, paint, pen, rhodia, sketch, sketchbook, watercolor, webbie, webnotebook on 20110317 by leslie.